Jim Haslett's defense is nasty. Guys line up everywhere. They smokescreen constantly, dancing and moving before the snap. And they come on every play. In preseason. At training camp. Against their own people. This is going to be very, very different. There will be mistakes of course—there are too many new assignments, substitution packages and post-snap adjustments to expect otherwise. But there's also going to be havoc in the plus column. Guys are going to spring clean to the quarterback, something Redskins fans have seen so little of around over the past several years that most have forgotten what it looks like. There will be running backs blown up behind the line—LaRon Landry started today's 11-on-11 drill with such a hit two yards deep, shooting a gap and laying the lumber on a startled Ryan Torain, who had just received McNabb's handoff. And there will be quarterbacks laid out. The big question early on—and this is something I will be mentioning again as we proceed through preseason and the Redskins get ready to face Dallas—as the new defense gels and guys get used to the rhythms and adjustments, will be whether or not the havoc they create against the other guys is enough to offset the mistakes that this kind of high-risk, high-reward approach necessarily brings. Regardless, one thing is clear. It's a new Redskins defensive day. 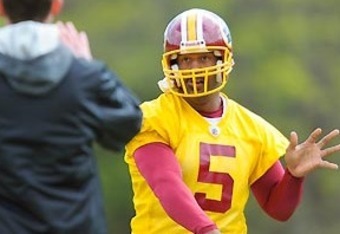 REX GROSSMAN - may be the perfect backup quarterback for this team. The man seems perfectly comfortable in the offense, throws an accurate and timely ball, and oh yeah happened to quarterback a 13-3 conference champion. Yes, he's thrown some meathead interceptions in his career. It's why he's now a quiet backup on a team coming off 4-12. But the man also has the physical chops to be a legitimate NFL quarterback. What he needs is fine tuning between the ears. Intriguingly, these Redskins happen to be stocked with Coach Shanahans. Quarterbacks tend to play pretty well for Shanahans. Don't sleep on Rex. CLINTON PORTIS - as much as anything, what stands out at this camp is something that doesn't. For the past several seasons Portis has been the focal point of this team, both on the field, where he was their best offensive player, and off the field, where he was their biggest mouth best quote and most likely to call attention to himself. Not so in Camp Shanahan 2010. Clinton Portis was on the field today, as he has been all camp. He took part in all the drills, looked fit and focused, and didn't seem any less the wear for the concussion that effectively ended his 2009 season. Sometimes the non-story is the story. Larry Johnson looks big, fast and ready to play. Clinton Portis looks ready to remind everyone that before he became a media vortex, he was one damn fine running back. DONOVAN McNABB - no way to avoid it. The man represents something the Redskins have not had in a generation—a Pro Bowl level quarterback still at or near the top of his game. Some will tell you that at 33 his best football is behind him. Maybe so. But watching him run the offense today—directing traffic, confident, on time, in charge ... if the vibe I caught today was any indication, Redskins fans are about a month away from seeing the difference that putting a legitimate big-time NFL quarterback on the field makes. Until then, it's all just words. WASHINGTON vs. BUFFALO, Friday, August 13, 2010, 7:30 pm. Just wanted to see it in print. This is pretty much just recycled feel-good homerism. In November when McNabb has been knocked out and Grossman actually plays, you'll see why Grossman isn't regarded as an NFL quarterback. And you'll soon learn why NFL teams don't let Pro Bowl players go for nothing -- Jammal can't stay healthy. If Heyer lines up at RT against the Cowboys, you'll have a rookie on the left and a ham sandwich on the right. McNabb is doooooomed. Finally, the defense should be great. It's been great for years. But if the offense can't score 20 points a game, it just doesn't matter. Ol' Joe Gibbs used to say you had to win two out of three aspects of the game. The Skins might win on D, but their offense and special teams don't scare anyone. Keep writing this fluff. Real Skins fans know BS when we see it. And we've seen a lot of BS with little Danny around. errr, this is an article about training camp...if anything he tempers expectations by saying we wont know what to expect until the dallas game. Not sure what recycled feel-good homerism you're referring to, but in terms of telling us how camp is turning out, I thought it did a good job. Yawn. Pretty much just recycled message-board snark. Good job. Thanks for actually reading the words.